Salt, pepper, and parsley, otherwise known as the “holy trinity,” were the dominant spices found in the kitchen where I spent my formative years. Fast forward from childhood to present day- I have traveled a bit of the spice route and collected a number of new spice friends along the way. Although it will take me a lifetime to truly master the art of spice I want to share a few facts and common uses for spices in food, starting with nutmeg and mace. My mom and dad, born in the early 1940’s, were children of first-generation Americans. My dad’s family were Polish and German and made their living as coal miners in rural Pennsylvania. My mom’s family, “fresh-off-the boat” from Italy, started in the Pennsylvania coal mines and then migrated to Little Italy, Cleveland. My Italian grandmother worked in cafeterias and factories and my Italian grandfather participated in the Works Progress Administration (WPA) projects, which created the vital arterial roads and bridges which connect our great cities. My grandparents worked hard, lived with very little money and dreamed of better lives for their children. This submersion into the hard-working American culture came with a price; traded were the ways of the “old world” such as language, culture, and knowledge of food preparation. When I tell friends that my mom is first-generation full blooded Italian, they immediately assume my childhood was spent in the kitchen mastering risottos or creating homemade pastas, sauces and sausages. Truth be told, my mom and dad also worked their derrieres off in order to provide my brother and I the best opportunities suburban America has to offer- which translated to less time spent in the kitchen. Weekday dinners in my house were relegated to one-pot meals greatly assisted by corporate food giants. Weekends were a bit more relaxing for my tired parents; we then feasted on a roast or spaghetti with meatballs. Even these weekend meals, prepared with the best of love and intention, seemed to be lacking in food artistry. Not much of the old-world charm or creativity carried over through the arduous journey traveled by my parents and grandparents alike. Spices were virtually unheard of, and food was largely flavored with salt and pepper with an occasional sprinkling of cinnamon. My food experience with my husband’s family has been quite the opposite. The first time I planned to meet my mother-in-law, dinner time was delayed by two hours as the kofta (meatballs) were not quite ready to be eaten at the scheduled time. We sat down to eat and I struggled to keep up in the conversation as my mother-in-law described the cooking process and the 21 spices included into the meatballs; I had never heard of most of the spices mentioned. My spice cabinet and my knowledge of spice usages has since then multiplied, yet I’m aware it will take me a lifetime to truly master all the spices bestowed upon us- spices that carry with them stories and traditions from my in-laws’ Pakistani, Indian, Iranian, and Maldivian roots. First up for discussion are nutmeg and mace. 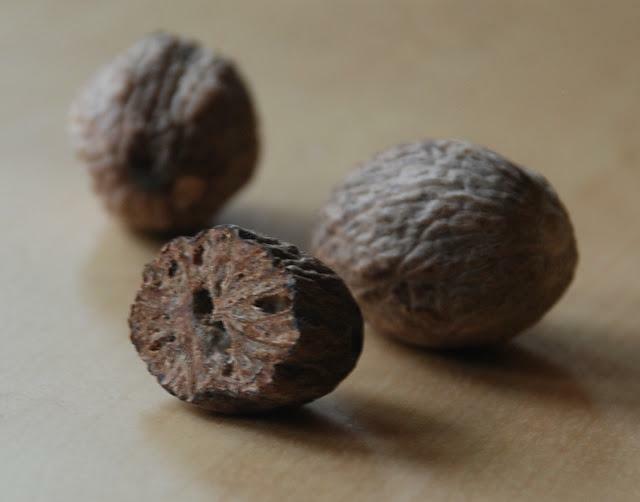 Nutmeg is the seed of the nutmeg tree and the reddish-orange lacy outer covering around the seed is mace. Both nutmeg and mace are dried and used in a variety of foods and are especially common in the South Asian cuisine we cook in my household. The nutmeg is shaved or grated using a grater or zester and the "blades" of mace are usually broken into pieces and added into masalas. Of course, you can obtain both in their powdered forms from your grocery or local food coop. As for flavor, nutmeg is generally hailed as the sweeter part of the nutmeg/mace duo. Mace is often used for its natural food coloring properties as it will turn a dish yellowish-orange in color and is noted for its more nutty flavor. Add grated nutmeg or mace into pumpkin bread, apple cider, butternut squash, and sweet potatoes. Ground nutmeg and mace are often paired together and used as part of a common spice blend known as garam masala, which is commonly found in Pakistani dishes such as korma and biryani. Using these two in conjunction is quite common in traditional Indian and Pakistani cooking. Nutmeg is also often used in bechamel, cream sauces and curries- creating a rich and savory high note while adding a new depth of flavor. Nutmeg's unique spice fact is that it contains myristicin, a psychoactive substance that has no known negative side effects in low doses. If consumed in very large doses it could lead to myristicin toxicity and could cause convulsions, nausea and induce delirium. Of course, when used in low doses outlined in food recipes, the only side effect will be a more enriched and flavorful dish and possibly a greater sense of well-being. Next up- a look at cloves and a multi-spice Pakistani recipe that is sure to excite your taste buds! Leigh Ann Ahmad was dragged kicking and screaming to the Cities by her husband; having been born and bred in Cleveland, Ohio, she just could not fathom how colder could be better. Now, five years and two kids later, she cannot imagine a better place to play and thrive. She’s a reformed carb-aholic, wannabe writer, social justice advocate, book-club geek, veggie grower and local foods connoisseur. Her last article for SGT was, Breaking Bread.